At my favorite coffee shop this week the barista asked me if I had any advice for helping her daughter with her math homework, and helping her daughter with her math facts. I sort of talked her ear off until she had to help the next person. Today it occurred to me that other people might have the same question, and also I had a lot more to say about that. So many students come to me in 7th or 8th grade struggling because they don’t know their math facts well. If they don’t know their math facts (ie 7×7=49) then when they’re trying to do things like long division or multiplication or even algebra things like foiling, every time they run into something they need to multiply they have to stop and figure it out by counting on their fingers or adding up a whole list of 6’s, and it completely distracts them from the problem they’re working on. Lots of times it looks like they’re struggling with what they’re learning, but really it’s just that they haven’t memorized their math facts well enough. However, I also meet students in high school who hate math (and therefore science and most of the really profitable careers) because someone tried to force them to learn their math facts in a way that made them feel really ashamed and frustrated and bitter. So, it’s a tight rope, and it needs to be done, but it needs to be done carefully. Ideally, learning math facts can be fun. A great place to start is with computer games like In Search of Spot or Number Munchers. Flash cards can be great, if you can make it fun. (i.e. positive. Praise them for getting facts correct, don’t say anything if they get it incorrect. Say things like ‘whoa that was fast!’ when they answer a fact more quickly than usual.) 5-10 minutes each day is ideal, don’t make it too long or it stops being fun. I like these flash cards. You can also get infinitely many free math drills here. A lot of time students come in with a familiar type of problem, but their teacher is having them solve it in a way I’ve never seen before. Long division methods change all the time. So do factoring methods. This is really hard, because you want to help and explain things, and the way you’ve always done things is so familiar. But, learning multiple methods is really confusing for kids. It’s almost always better to try to teach them the method they’re learning in class. Because their teacher will build off that later. This, of course, means that if you’re going to help them with their homework you have to first try to understand this new method yourself. The first thing you need to know is that it’s probably more similar than it looks at first, and if you think about it for a while and look at slides/notes from the teacher you can usually figure it out. There are also lots of online resources that will explain these new methods. My two favorites are Khan Academy and Purple Math. Also, if you run into something you’re stuck on, post a comment here or email me and I can try to help. In general, especially for younger students, the absolute most important thing is that it’s fun for them, and that they start to feel like math is something they can be good at. That idea will get them through many future math classes and will help them be successful eventually, no matter how hard it is. A few weeks ago I came across Magnetism: A Very Short Introduction while looking at other books in the same category as mine. It’s written by a physics professor at Oxford, and it’s completely fascinating and entertaining. Not what I expected at all. I was expecting something pretty dry, and focused on the physics. Instead, Stephen Blundell, the author, gives a whole historical background complete with descriptions of how people used to think magnets could heal them of psychic illnesses. He also tells the stories of the physicists who discovered these phenomena. I loved seeing them as human beings, with personalities, rivalries, getting passed up for jobs/promotions, and being embarrassed that they weren’t very good at math. It doesn’t have any equations or math in, it’s all about the concepts and the history. This explanation was written up by Caleb Pool, who very kindly gave me a bunch of awesome feedback on my Kinematics book, and then wrote this cool explanation of Orbital Dynamics that I thought you might find interesting/useful/entertaining. When we look outside, we see ground that is pretty flat. 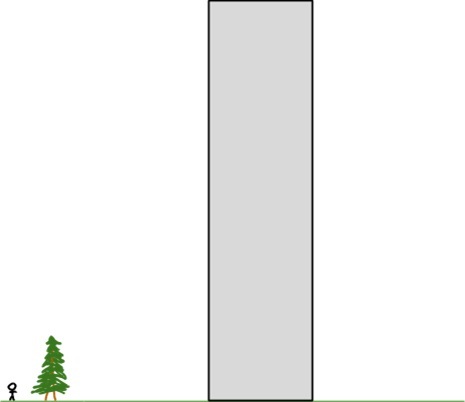 Trees go straight up, buildings stand up, and the ground is perpendicular to those. Even buildings look like they stand up straight. Water looks very flat when we stand next to it. If one side of a pond is higher than the other, the water flows until it is level again. Gravity pulls the water equally until it looks flat from a close perspective. But what about when we start zooming out? The water still looks flat to us. We zoom out some more. It seems the earth is round. But we knew that. How can all the water stay on without falling off? Gravity pulls objects (and water) toward the center of the earth. Although, from our perspective, things fall down and water looks flat, the bigger story is that things fall toward the earth’s center and water curves around the earth. 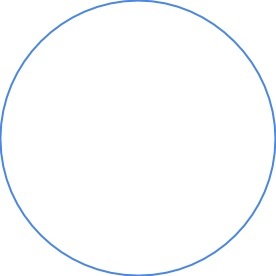 This bulge makes the earth’s radius through its equator about 3,963 miles (6,378 km), when its radius through the poles is 3,950 miles (6,356 km). 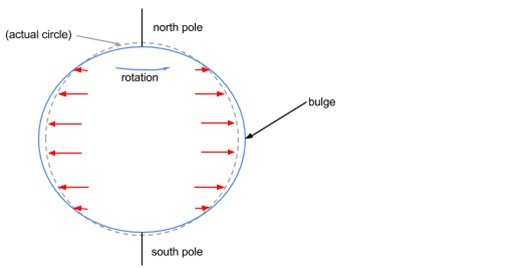 A bulge that causes a 13-mile difference in radius between the poles and equator seems like a lot, and it is, but that bulge is not very big compared to the earth’s overall size. That bulge plays an important role in many orbits. 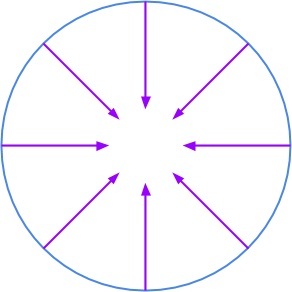 The basics of an orbit work even if we consider the earth to just be a sphere for now. Suppose you find an extremely high mountain that reaches above the earth’s atmosphere and you hike to the top, carrying an extremely powerful cannon. You keep increasing the power on this magic cannon and firing away from your mountaintop. The cannonballs fly so far that, as they fall toward the earth, the earth starts curving away underneath them. And look what just happened! The cannonball went all the way around the world! If you step out of the way, you get to watch it zoom by really fast (remember, you had to fire it fast enough to go that far!). What happens now? 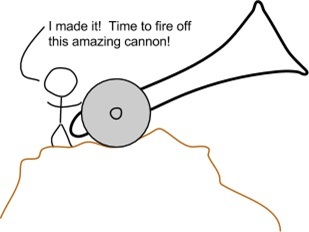 The cannonball doesn’t just stop dead in its tracks after it goes around once; it keeps going around. And around. It turns out that you have just made a satellite and launched it into orbit. 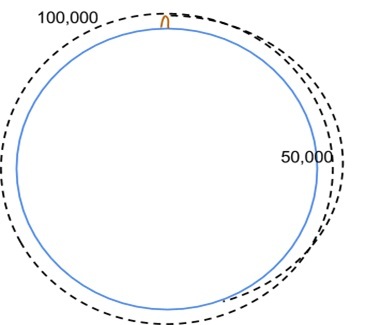 Until it gets slowed down by the thin atmospheric gas at the edge of space and burns up, your cannonball will continue to fly through space, following the same path as it circles the world. Your special cannonball now joins the moon (earth’s only natural satellite) and a host of about 40,000 man-made objects as it endlessly circles in orbit. 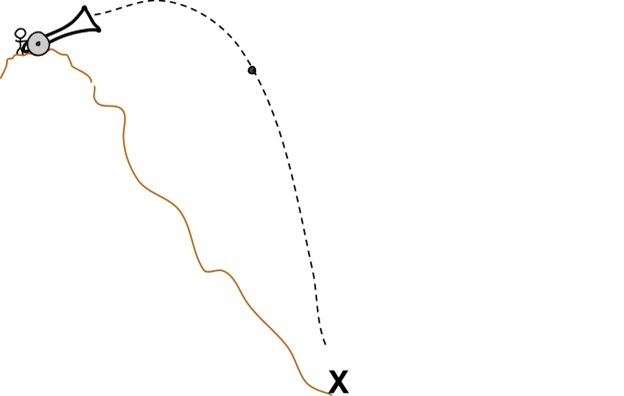 As gravity pulls the cannonball toward the earth, it falls, but the earth’s surface curves away just as fast, so it never gets any closer to the earth as it goes around. Now that you are satisfied with your powerful cannon, you look at other orbiting objects to see how they behave. 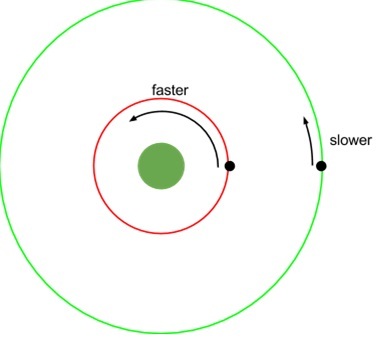 Objects in orbit that are farther away from the earth go around it more slowly. This is primarily because earth’s gravity is weaker the farther away from the earth you go. Example: Which is farther away from the earth? The moon, which goes around once a month, or a GPS satellite, which goes around twice each day? Answer: the moon is farther away.